Our care suites provide residents with much more space than nursing home bedrooms, but with the same level of nursing care and support. At Rodwell, they are specially for dementia sufferers who would otherwise need to move into a traditional EMI nursing home. Dining space so that residents can enjoy their meals in their own room, if they wish. 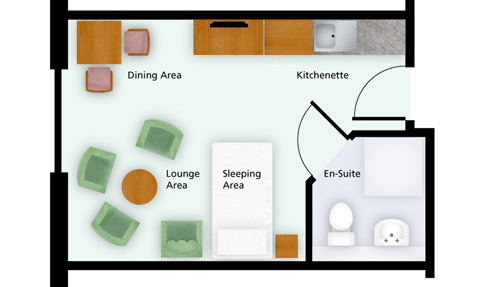 A kitchenette so that residents and their guests can prepare drinks and snacks. There is a choice of studio or one bedroom suites, all with en-suite shower rooms. They all benefit from the secure entrance to the building. Residents spouses can also be accommodated, so that couples can stay together even when one develops the need for on-going care. 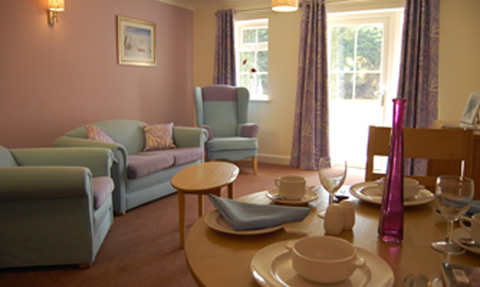 Hazeldene House is registered to provide both personal and nursing care to the residents of the suites. The in-house team of registered nurses and carers is available 24 hours a day to respond to the residents’ care needs when required. With Registered Nurses available on-site, the suites offer a permanent home where the residents do not need to worry about moving when their care needs increase. The move into a care setting often results in many of a residents’ key relationships being fractured. The facilities provided by the suites are therefore particularly important as comfortable places to visit where residents’ relationships with their families and friends can flourish. In support of this, our homes organise age-specific events to encourage the various generations to visit residents more often and ensure that the possibility of loneliness is minimised. Click here to view more photos of our spacious care suites and their surroundings. Summary and photos of the care suites.